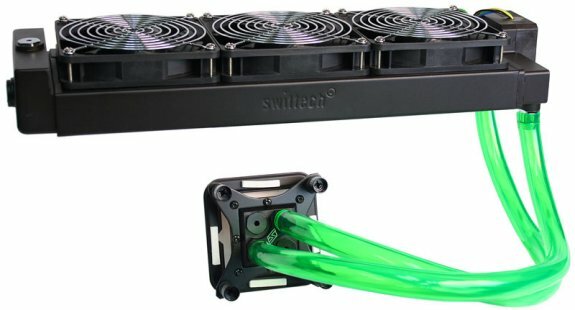 Rouchon Industries, Inc. dba Swiftech® today announced the release for retail sales of the H2O-x20 Edge “HD” series liquid cooling kits using their new flagship CPU waterblock the Apogee™ HD and the patent pending MCRx20 Drive (Rev3) series of PC radiators. The new kit series announce uncompromised performance, functionality, and simple installation at a reasonable price. “This new generation offers an ease of installation which is very close to that of other all-in-one kits, but it does it without sacrificing performance and functionality: users can take full advantage of the power of liquid cooling i.e. low temperature and low noise while not being restricted to CPU-only cooling as is the case with other all-in-one kits” said Gabriel Rouchon Swiftech’s Chairman & CTA, further adding “ Of course, top performance and modularity do carry a price premium, mainly because we use such a powerful and sophisticated pump in our system, but thanks to volume manufacturing we can now offer these kits at a substantially lower price compared to initial introduction. The bottom line is this: if you are going to use a dual or a triple 120mm radiator in your system, there is no question in my mind that it should be able to cool CPU, Graphics, and anything else you want to throw at it”. The H2O-x20 Edge HD kits are shipping now to Swiftech dealers worldwide.